Jesus had heard that the Pharisees were talking about him having baptized and made more disciples than even John--even though he had never baptized anybody with water and it had been his disciples who had done that--he left Judea and headed back toward Galilee. He decided to get there by going through Samaria. He stopped in a city called Sychar which was near the place Jacob had given to Joseph. The well Jacob had dug was there and Jesus stopped at it because he was tired and it was very warm since it was about noon. 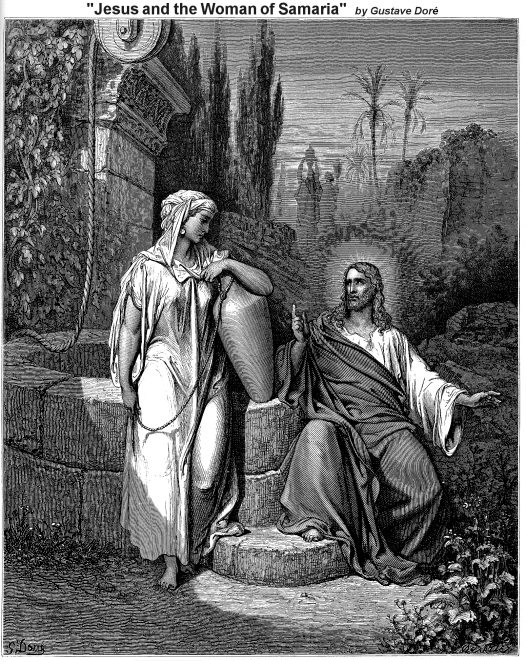 A Samaritan woman named Photina came to get water from the well while Jesus was there but the disciples had gone to the city to get food. Jesus asked Photina for a drink and she responded: "Aren't you a Jew? Would you really ask a Samaritan woman like me for a drink? "She knew well that Jews refused to associate or share with Samaritans. Jesus responded, "If you really knew what was happening here, then you would have asked me and I would have given you living water." "You have no bucket, sir, and this well is very deep so where are you going to get this 'living water' you're talking about?" she asked, "Whether you like it or not, Jacob dug this well and his sons and flocks--the ones the Jews claim as only their own--drank from it. Are you greater than Jacob?" 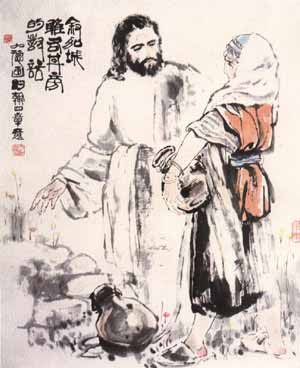 Jesus said to her, "If anybody drinks the water from this well, they'll become thirsty again but the water I offer is different. When you drink the water I offer, within you it becomes a spring of water gushing up to eternal life." 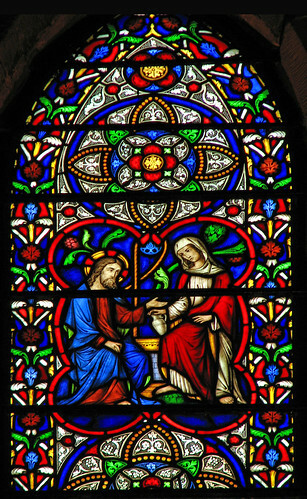 Still not quite getting it, the woman relented and, perhaps somewhat incredulously, asked Jesus for some of his water so that she might never be thirsty again and might never have to return to the well. Jesus understood that she still didn't quite get it and so he said to Photina, "Go, get your husband and come back with him. "Photina told Jesus in a small voice that she did not have a husband and he responded with all the truth, "You're right when you say you have no husband but you've had five before and you're living with a man now who is not your husband." Photina was shocked and perhaps struggled to find the words, at first, but she was starting to get it. She responded, "Sir, I can tell you're a prophet, so answer a question for me: Our ancestors worshiped on this mountain here but you Jews say that the right place to worship is in Jerusalem. Which is correct?" Jesus said to her, "Believe me, the time is coming when that question won't matter. Right now, you worship what you don't know and we worship what we know--don't forget God's promise to Abraham that salvation comes through the Jews. But the time is coming--in fact, it's here right now and right at this well--when the true worshipers of God will worship God not in Jerusalem or in Samaria but in spirit and truth. This is what God desires is worship, after all. God is spirit, and those who worship God must worship in spirit and truth." Photina said to Jesus, "Oh, I know that Messiah--salvation--is coming and when he comes, he will proclaim all things to us." Jesus smiled and said to her, "I am he. I am the one you're waiting for." As he said that, his disciples rounded the corner with food in their arms. They were astonished that he was speaking with a Samaritan woman by himself at the well but they knew better than to rebuke either Jesus or Photina. 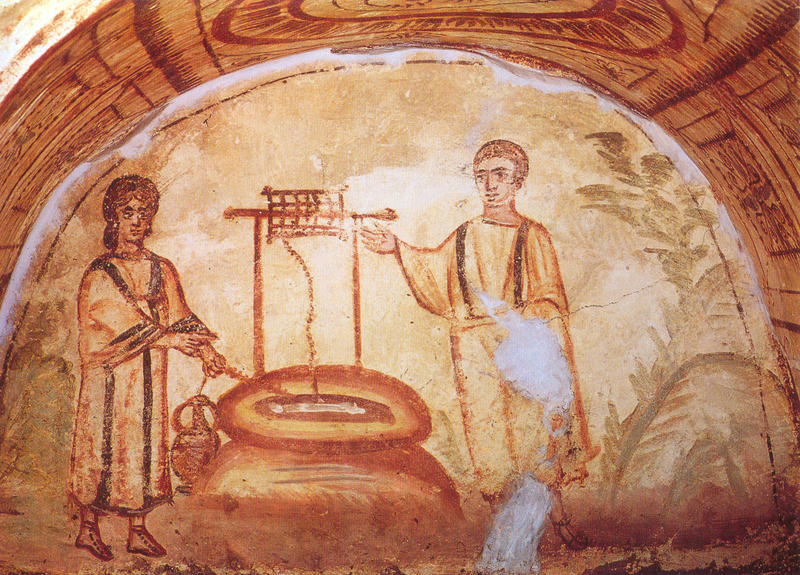 Photina returned to the city and gathered people to come with her saying, "You won't believe whom I met at the well. I met a man who knew everything I had ever done. Could this one be the Messiah?" The Samaritans came out to the well with Photina. At the same time, the disciples were urging Jesus to eat but he said to them, "I have food to eat that you know nothing about." They didn't understand what he meant. They were not quite getting it. So, he continued, "What sustains me is doing the will of God and to complete my mission and work. Don't you say, 'Look at the fields...only a little while longer to the harvest?' Stop for a second and look around and you'll see how the fields are ripe for harvest--people are ready for salvation. Some are already being brought into the fold. For here the saying holds true, 'One sows and another reaps.' You've been sent out to reap and harvest what you didn't sow. You've not started salvation, you've joined in with salvation already in progress." Then, the Samaritans arrived at the well with Photina and many were already placing their faith in him because of what Photina had said. They asked Jesus and disciples to stay with them and be their guests and they did so for two days. He accepted their hospitality and had many conversations with them and because of these conversations even more believed. It was then that they began to say to Photina, "It's not just because of your words that we now believe. We've heard him speak to us as well because of you and we believe that this one truly is the Savior of the world.